Someone played a bad joke on Inter Saturday night, and Roberto Mancini wasn’t laughing. And who can blame him? Juventus waited until the return leg of the Derby d’Italia to come back to greatness: true greatness, the kind that makes you feel part of European football’s Elite. The Evidence? The players. From Gianluigi Buffon (proving once again why he’s considered to be the best goalkeeper on Earth) through to Giorgio Chiellini (who is slowly achieving superstar status as a center-back) and Mauro Camoranesi (Juve just can’t do without him), all the way to David Trezeguet (another vital goal to maintain the lead of the Serie A scoring charts), every man on Claudio Ranieri’s team was almost perfect. The only one coming a little bit short: Alessandro Del Piero, failing to finish two key 3-0 chances that’d have put the game on ice for the Bianconeri, but the author of an otherwise A+ performance. On Saturday night, in a 58,000 spectactor-laden Stadio Giuseppe Meazza, the Bianconeri achieved what no other Serie A team has managed to do this season: beat Inter Milan at home, in the temple of Italian football. Tactically, Inter manager Roberto Mancini received some happy news in the last-minute recovery of Brazilian wing-back Maxwell, and decided to go ahead with his one playmaker (Luis Jimenez) and two strikers (Ibrahimovic and Cruz) formation. Right in front of the defense (due to Patrick Vieira’s forced absence) were main men Javier Zanetti, Dejan Stankovic, and Cristian Chivu. On the other end, Claudio Ranieri had to deal with the absence of Cristiano Zanetti due to injury, and thus proposed Mauro Camoranesi in an unusual center-mid role alongside Momo Sissoko, supported by Pavel Nedved and Hasan Salihamidizic on the wings. Up front, scoring duties were left to Alessandro Del Piero and David Trezeguet. Since minute 1 of the first half, it became obvious there was great tension at the San Siro tonight. Both teams were being very careful in not conceding too much space, while concurrently actively searching for some real estate of their own, preferably in the opponent’s half. What this translated into for the first 45 minutes, was a lot of ball possession but not a high number of chances getting created. Those that did earn a spot in the highlights reel however, helped in providing the excitement necessary to keep neutral spectators entertained. The first of these was to the benefit of Juventus: in minute 7, a great left-wing crossing delivery from Nedved found Alessandro Del Piero on the opposite post, ready for an acrobatic half-volley which Julio Cesar instinctively deflected over the bar. 10 minutes later, it was Inter’s turn to reply: from a Luis Jiménez free-kick, Nicolas Burdisso astonishingly missed an open-net tackle from close-range, causing the ball to loop up towards Dejan Stankovic, who headed it on top of the crossbar! Two close shaves per side. Before the break, the other notable highlights of the first period included a Chivu free-kick (deflected wide by Buffon) and a Sissoko one-timer from outside the box (ably neutralized by Julio Cesar). The 0-0 half-time scoreline was testament to one clear fact: this match was being played with great intensity and determination by both teams, but neither of them had pushed hard enough on the gas pedal in order to score first yet. Also, without necessarily getting nasty (there was great fair-play between players throughout), the match was certainly getting physical (4 yellow cards had been handed out by referee Stefano Farina, equally shared amongst the teams). In the second period, Juve immediately resumed their assault. In minute 46, a great half-volley by Nedved found the ready hands of Julio Cesar to deflect wide, but it was only the prelude to Juve’s goal coming 3 minutes later. From a Cristian Molinaro through ball from the center zone, the ball was left by Giorgio Chiellini for an unmarked Mauro Camoranesi, and one-on-one with Julio Cesar the Italo-Argentine did not miss his chance. Low shot below the Brazilian keeper and 1-0 Juve, despite the Bianconeri midfielder was clearly offside when the pass was made. At this point, Mancini decided to remove a slowly disappearing Jiménez and insert the speed and agility of David Suazo. The Juve defense had however the situation well under control, and with confidence and momentum behind them, Ranieri’s men doubled their lead 15 minutes after their first tally. Exploiting a pass inside the box, Del Piero deliciously flicked the ball over for David Trezeguet. Burdisso attempted to intercept the pass, but his header ended up serving it up on a silver platter for the French striker, who armed a powerful left-footer and left Julio Cesar cold. 2-0 Juve. You would think that at this point, Inter would offer some kind of a pride reaction and launch everything they had towards Buffon’s goal? Not so. Juventus continued to dominate and dictate play, while Alessandro Del Piero had obviously taken his vitamins pre-match, because he continuously sent Marco Materazzi into a spin. In minute 67, the Juve captain could have made it 3-0 but his left-footed attempt (after yet another dribble on Materazzi) found the hands of Julio Cesar. Even more shocking, was Del Piero’s lone run down the left wing 5 minutes later, which ended up in Maicon catching up and the ball ending in goal-kick (Trezeguet was waiting all alone on the second pot). Want even MORE Shocking? The two-on-one counter-attack featuring Del Piero and Trezeguet, with the Italian and Frenchman exchanging passes twice before the Juve captain blasted the ball… straight at the Inter keeper! Talk about missing the unmissable. Alas for Juve (and I’ll never get tired of mentioning this) “but raté, but encaissé” as the French say, and what could have been a 3-0 game-over goal turned into 2-1 two minutes later, as Inter reduced their deficit. Some good dribbling work by Maicon on the right wing gave the Brazilian wing-back space to comfortably set up Maniche (on for Cruz) straight in front of the goal, and the Portuguese midfielder had no trouble in scoring his first Serie A goal and putting Inter back in contention. With the Inter’s 83rd minute goal, Juve were now pushed to the ropes and had 10 minutes to resist the Nerazzurri’s final rush. Mancini’s men were, by then, attacking without any real tactical disposition but had momentum and determination going their way. The Bianconeri backline were sweating hard, and almost paid a heavy price when Maniche (him again) exploited a good Ibrahimovic backheel to get behind the defense, but his toe-poked sliding effort could only find the outer part of Buffon’s left post, before going wide. INTER (4-3-1-2): Julio Cesar – Maicon, Burdisso, Materazzi, Maxwell – J.Zanetti, Stankovic, Chivu (82’ Balotelli) – Jiménez (52’ Suazo) – Ibrahimovic, Cruz (64’ Maniche). (bench: Toldo, Rivas, Solari, Crespo). Coach: R.Mancini. JUVENTUS (4-4-2): Buffon – Grygera, Legrottaglie, Chiellini, Molinaro – Salihamidzic, Camoranesi, Sissoko, Nedved (86’ Nocerino) – Trezeguet (83’ Iaquinta), Del Piero. (bench: Belardi, Birindelli, Stendardo, Tiago, Palladino). Coach: Ranieri. This entry was posted on Sunday, March 23rd, 2008 at 3:54 am	and is filed under Inter, Juventus, Serie A. You can follow any responses to this entry through the RSS 2.0 feed. Both comments and pings are currently closed. New Holland? It just doesn’t look right, does it? Juve are looking imperious at the moment. I suspect next season will be the big one for them. They are starting to really look good. Now where are those fans who were writing in favor and with all those exaggerated praises about Ibrahimovic in the recent debate about him, tell us where Ibrahimovic was in this game with Juventus. It is time we all accept that he is just an ordinary player who does not win big games. It is time Inter find a talented replacement soooooon. Will Mancini give his letter of resignation now (again)? “Inter down to their knees” indeed, beaten by a decimated post-Calciopoli team. This Juve squad is getting back to their well-deserved heights!! Zlatan was once again a ghost, but it’s not the rest of his team-mates played any better. Juve played the perfect match. Sooooo disappointed that Del Piero coudn’t finish his chance or it would have been a helluva goalfest. 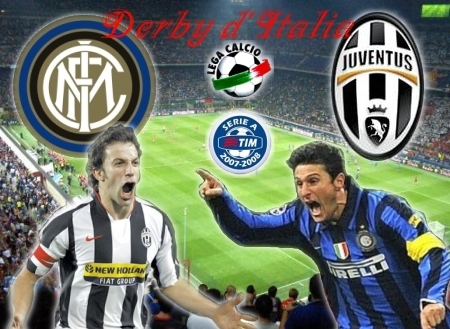 Just thinking that Materazzi will go to Euro and Del Piero won’t makes me sick to my stomach. its time Mancini leaves.the statement he made is affecting that team and he got little to add or take out from that team.let me leave in peace as he decleared.No more buying of refs!!! I did not see Ibrahimovic, was he playing? Some fans said that he is a great player. Did you see a great striker on the pitch aside from Trezeguet?. Ibrahimovic is a great magician, he disappears during big and important games. I am a very disappointed Inter fan!!!! Two years later, same old story: Juventus are still winning by cheating. Camoranesi was a mile offside. Kalippo, i think inter had it coming to them. This is season, referees have favoured inter in a clear way and for them to concede such a controversial goal from JUVE makes it that much sweeter. As for inter’s defence though, i believe that BURDISSO shouldnt even be allowed to play in Serie A. Its way beyond his capabilities and im not the only one who thinks so. Cesare Maldini himslef said so yesterday.